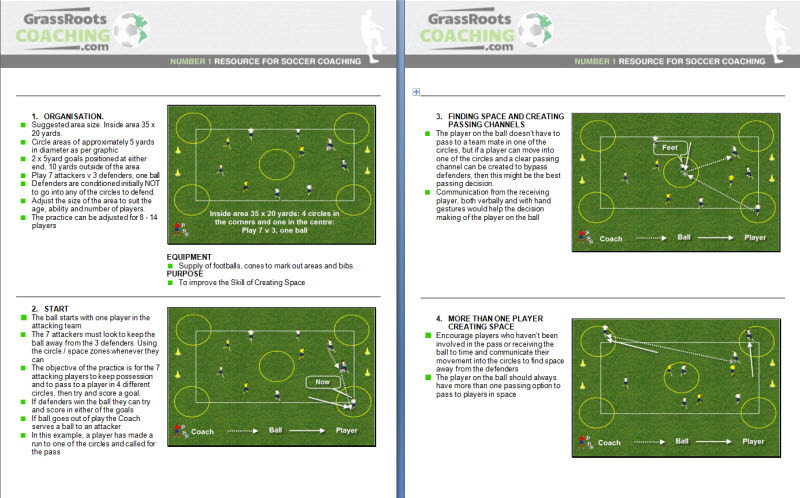 This follows on from the previous blog, which we offered the Free E Book – Technique of Creating Space, which again is a topic candidates will be asked to coach on a Soccer Coaching Course. So what is a Skill and what will you be asked to coach on a Soccer Coaching course? A skill is a progression from the technique. The technique is unopposed, allowing the players to develop their techniques and confidence in performing these techniques successfully without pressure from opposition players. The skill session introduces opposition players to create pressure, not only on the players’ technique, but on their decision making now that they are under pressure from opposition players. So for example, the Skill of Creating Space now introduces opposition players that will try and close space down. The players will have to not only employ the Techniques of Creating Space that they learnt and practiced in the Technique of Creating Space, but be able to make the right decisions under pressure on when, how and why they would use these techniques when opposition players are trying to pressure the ball.